When it comes to protecting your property and the people within it, insurance is often in the same conversation. Having a policy in place to preserve your investments is important– but do not overlook the things you can do prevent a security breach in the first place. A more secure property is often more affordable to insure, so if you are interested in saving money: read on for more! ARC’s insurance professionals have compiled the following list of five easy and effective tips. Anyone seeking to enter your home will not come down the chimney or through an underground tunnel– doors and windows are meant to be opened, they are vulnerable targets. Luckily, these are usually quite simple to secure: always close and lock an outer door when not in use; same with windows, using or adding a lock if at all possible. To ensure ongoing security, perform routine checks of all locks and opening mechanisms like latches and hinges. Look for signs of tampering and repair any damage immediately. Brightening dark areas is one of the easiest and most affordable methods of deterring theft and other mischief. Do not give people a place to hide! Thanks to modern technology, it is easier than ever to install outdoor lights hooked up to timers, motion-sensors or even smartphone apps. Similarly, consider using automatic indoor lighting when you are away to give the sense that someone is home. If you have a carport, fenced yard, shed, trailer or storage area, do not underestimate what someone will take if it is not properly secured. Anything that can be carried away is at risk of disappearing when you are not paying attention. Sports equipment, tools and children’s toys are particularly vulnerable, but lock down every item that you might miss. Also, beware of leaving items in locked vehicles– they are prime targets! Just like automatic lighting, the 21st-century has made many new security devices affordable for the average property owner. There are countless security system companies that can install their own equipment and even more do-it-yourself options supported by wireless networks and smartphone apps. 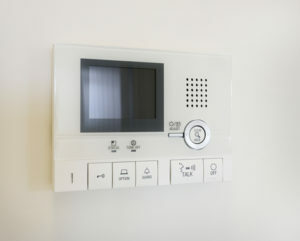 Cameras, alarms, motion-sensors and two-way speakers are just some of the digital tools at your disposal. As a property know, one of the easiest security measures is by being a people person. Make sure all residents are on the same page with regular meetings about safety, security and any relevant news. Introduce and familiarize yourself with the property’s neighbours, they are a valuable resource for safety– one set of eyes (and even the best cameras) cannot be everywhere all at once! The above five tips are a choice cut of the many ways you can reinforce the security of your home. When seeking insurance, an ARC broker may be able to lower your premiums if you follow some of these safety measures. Questions? Concerns? Contact or visit us today!